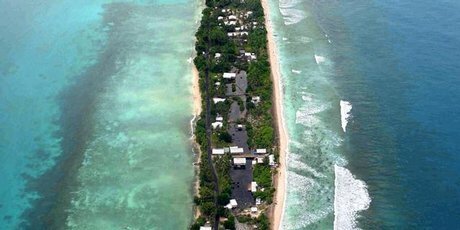 New Zealand is working with the United States to get supplies to drought-stricken Tokelau, which has less than a week’s supply of drinking water. The aid comes after the Pacific nation and its neighbour Tuvalu declared states of emergency over a lack of fresh water. New Zealand has already sent a Hercules with supplies to Tuvalu. Parts of Samoa are also starting to ration water. A Defence Force Hercules carrying water containers was due to fly to Pago Pago in American Samoa this morning, where it will meet up with a US Coastguard vessel. The ship, which has an on-board desalination plant to fill the containers, will then travel to Tokelau’s three main islands. Foreign Minister Murray McCully said the water tanks would provide about 136,000 litres of water, which would be sufficient in the short term. Supplies are precariously low after a severe lack of rain in a region where underground reserves have been fouled by salt water from rising seas that scientists have linked to climate change. While nobody has gone thirsty yet, officials worry about the logistics of supplying everyone with enough water to survive and the potential health problems that might arise. And exactly how the islands will cope in the long term remains a question mark. “We are praying that things will change,” Samoan-based official Jovilisi Suveinakama said. Climate scientists say the six months of low rainfall is part of a cyclical Pacific weather pattern known as La Nina, and they predict the pattern will continue in the coming months, bringing no relief. Rising sea levels are exacerbating the problem, as salt water seeps into underground supplies of fresh water that are drawn to the surface through wells. On the three main atolls that make up isolated Tokelau, the 1400 residents ran out of fresh water altogether last week and are relying on a seven-day supply of bottled water that was sent on Saturday from Samoa, according to Mr Suveinakama. He said some schools no longer had drinking water available and students often had to go home to use a lavatory. Mr Suveinakama said Tokelau, a territory of New Zealand, had tapped emergency funds to buy desalination machines. He hopes those will be shipped to the islands soon. In Tuvalu, a nation of low-lying atolls that is home to fewer than 11,000 people, Red Cross team leader Dean Manderson described the situation as “dire”. On Tuesday he said the island of Nukulaelae had 60 litres of fresh water for 350 residents and the Red Cross was sending over two desalination machines. New Zealand this week flew a Defence Force C-130 plane to Tuvalu stocked with Red Cross supplies of bottled water and desalination machines. Officials including High Commissioner Gareth Smith also flew over to assess the situation. Mr Smith said local fruit and vegetables were not growing well or were in short supply. Residents of the capital, Funafuti, are rationed to two buckets of water a day, and government ministers have been bathing in the lagoon to save water. Mr Manderson said Funafuti residents had been relying on a large desalination machine for much of their daily water supply. New Zealand climate scientist James Renwick said the rainfall problems could be traced back 12 months, when the region began experiencing one of the strongest La Nina systems on record. He said La Nina was sparked when larger-than-normal differences in water temperature across the Pacific Ocean caused the east-blowing trade winds to increase in strength. That pushed rainfall to the west, leaving places such as Tuvalu and Tokelau dry. 1400 people on three main atolls ran out of water last week. Relying on supplies sent from Samoa. Officials have bought desalination machines. NZ has sent supplies and desalination equipment.